Geofencing or Beacons: Which is the best fit for your business? Home > Blog > Geofencing or Beacons: Which is the best fit for your business? A Snapshot of Geofencing, Beacons usage in Enterprise Mobility and Consumer Marketing. Over the last few years, the journey of Location-Based Tracking Technology has taken some interesting turns. Leveraging the technology along with user location and time has become the ultimate tool for contemporary marketers to promote products and services and engage prospects more efficiently. Today, Geofencing and Beacons are bellwether technologies, ready to invade the entire business realm and boost customer experience. These mobile technologies allow customers to avail personalized offers based on their needs and interests. For instance, imagine when you walk into your favorite store, your smartphone starts notifying you about the offers and promotions in the store that you might be looking for. Moreover, the manager greets you by your name and demonstrates the products you liked earlier on your app and also shows you similar products that you might like as well. Wouldn’t that be an awesome experience? If you are planning to plunge into location-based tracking strategies for your business, there is one vital question that you’ll need to answer – what is the difference between Geofencing and Beacons? Actually, these two technologies supplement rather than conflict with each other because they try to achieve similar goals by identifying user’s proximity to a specific location and triggering an action accordingly. The following distinctions give you better clarity about the technologies and help you understand which is the best fit for your business. Geo-fencing: Invading B2C and B2B! Geo-fencing is a GPS enabled software technology that will create a virtual geographic boundary. It allows the administrator to set up triggers when potential customers enter or leave this boundary. The trigger can be a promotional alert or text message, sent directly to the customer’s mobile device. GPS works on signals from satellites. A computer program in the mobile device notes the time of arrival of the signals received from various visible GPS satellites and is able to work out the user’s latitude and longitude position and height. But the accuracy of this data depends on several other factors which may affect the positioning results. Today, geofencing is quite popular among marketers as they can send offers and coupons to their customers, moreover, it can also be used to provide more personalized experience to customers. It allows the salespeople to track VIP customers coming to their store by their purchase history and offer them personalized services. To use geofencing technology, brands must develop an app and encourage the customer to download it, and then the user can opt to get notifications. As geofencing covers larger areas, it is best-fit for the outdoors and lesser effective than beacons in capturing person’s exact location. It helps marketers engage smartphone users via messages when they enter or cross a defined geographic area, such as a shopping mall, retail store, stadium, etc. Even for B2B segments, geofencing couples with prominent Mobile Device Management (EMM) platforms like SureEMM and allows administrators to create a virtual fence around an office building or warehouse. Administrators can configure policies that are applied to the devices as they enter or exit the fence. This combination of geofencing and EMM caters to multifold needs in B2B sector. Following are few of the use cases you must know! Geofencing in EMM allows you to disable peripherals like the cameras, it allows an enterprise to prevent users from taking pictures in secured areas. 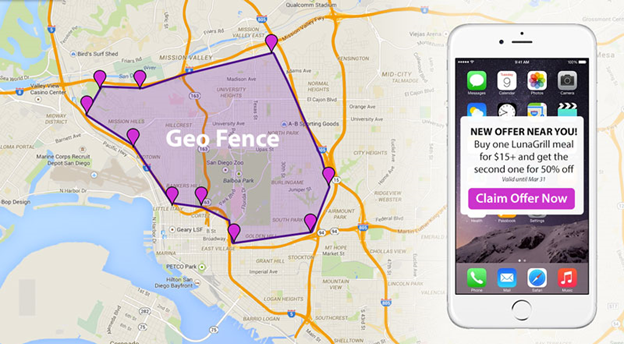 Geofencing integrated with EMM can help to configure emails, install apps, and enable location tracking on devices whenever they enter fenced locations. Organizations can use geofencing to monitor workers as they enter and leave the workplace. In the case of any violations, alerts can be sent to the management team. This is especially useful for workers with location-specific roles. Moreover, in mining sites or chemical factories, the workforce can be restricted and prompted with push notification about their movement into a high-risk area or danger zone. Another significant aspect to note here is that geofencing uses GPS, which consumes a lot of battery from customer’s or employees’ mobile devices as it needs cell phone network and satellites to capture a specific location. Beacons: an evolved form of geofencing in consumer marketing! 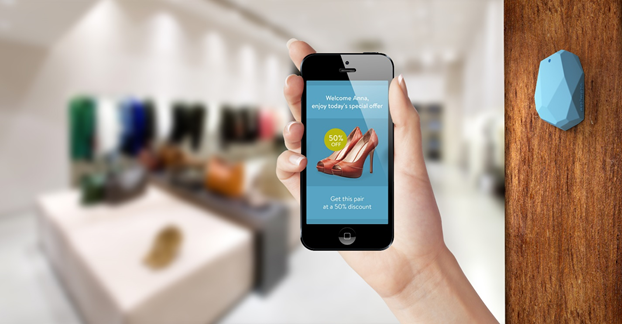 Beacons are the path-breaking technology in geo-marketing space today. 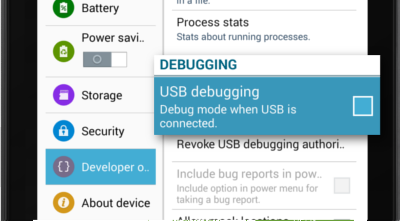 A Beacon is based on BLE (Bluetooth Low Energy) which is quite different from the conventional Bluetooth technology as it consumes very less power and it does not require tedious pairing or connection. Basically, it requires a hardware that transmits signals that smartphone can receive when the users opt-in for the same via a specific app. Beacon technology allows Mobile Apps to understand their position on a micro-local scale, and deliver hyper-contextual content to users based on location. Whenever a smartphone comes in a beacon range, it wakes up and activates the receiving app. Beacons cater to a very meticulous estimation of customer’s location (within inches). Beacons give the exact proximity and can intimate if the user has actually entered the premise or not. The retailer can use the technology to alert a customer standing in front of a particular display or shopping in a specific aisle with messages of product reviews, coupons or click-to-buy options. Moreover, the technology can also help the customer look for a specific product within the store. Beacons: Taking Enterprise Mobility By Storm! Aside from its inception into the B2C space, we strongly believe that beacons technology is also strong enough to take enterprise mobility by storm, by improving employee productivity and business processes. Beacons use cases in B2B: a quick tour! The efficiency of teams that are responsible for patrolling buildings can be improved using beacons. By placing beacons around patrolling areas, the app will help to detect if any of the rounds have not been completed and a notification will be triggered to the concerned department to remind them about the areas they have missed. Beacons can prompt workers about the presence of a high-risk equipment or machinery in the proximity and help in sending contextual information to the mobile apps that may contain safety guidelines, product information, check lists, etc. Moreover, jobs that require a certain checklist to be ticked off can use beacons to activate the relevant list for a respective environment, improving safety and experience. Beacons in healthcare, play a remarkable role by activating the apps to let staff and patients receive relevant information about a situation regarding health, medical history, appointment details, etc. Any point in enterprise mobility, where management is required to be done at the micro level, deployment of beacons can yield extraordinary results. As per today’s EMM protocols, an enterprise can use geofencing to control handheld features within office premises or in an area with a relatively larger perimeter like campus or building. But for a fact, there are certain areas like classified compartments, floors, etc. 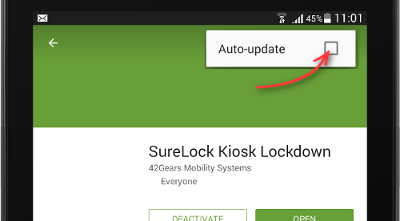 where features and apps need to be temporarily disabled. This is where, EMM needs to be enhanced and integrated with beacons through micro-location abilities using Bluetooth Low Energy (BLE) which will disable cameras, volume settings, microphone etc. If EMM is enhanced to support iBeacon or Eddystone feature, then it’s just a matter of judicious placement of beacons inside the corporate periphery. It will then allow IT Admins to define specific beacons to represent a specific location or area, providing geofencing capabilities for security policies. This offers an efficient security control over employees and their handheld devices in the BYOD scenario. Eddystone is an open protocol, announced by Google in July 2015. While iBeacon works on UUID only, Eddystone works four frame types both on iOS and Android devices- URL, UID, EID and TLM. However, numerous organizations have started using Beacon management platforms to manage multiple beacons in real time like Beaconstac. Beacons or Geofencing or Both: Possibilities are limitless! Now that we know the basic differences between GPS and beacon, businesses can decide on what to use – only geofencing or both? However, the decision must depend primarily on business objectives. For a fact, geofencing is efficient for wider marketing campaigns where customers are targeted at a broader scale, such as when they are walking by the entrance of a store or mall or driving around a parking lot. On the other hand, beacons have the caliber to track customers and employees with higher accuracy, allow micro-fine location support in areas with limited to no GPS coverage, can be well leveraged with in indoor services such as within stores or malls or improving security management inside an office premise. Lately, with the widespread use of both technologies, numerous marketers have begun to churn out maximum benefits – not only with through individual deployments but by using a blend of both. Use cases to understand: The blend matters! It notifies the restaurant or store staff by the in-store system that the customer who booked a table or ordered items is nearby within a quarter mile. This way the geofencing technology can ensure that the food is served on time. While beacons can alert the staff to keep the order ready when the same customer drives into the parking lot or walks into the store or restaurant. In the office campuses – managers can easily switch off the mobile camera recording during the confidential presentation or meeting. Also by placing the beacon at specific locations, employees can get Wi-Fi connectivity instantly based on the organization’s internal security policy. Stores can set up geofencing outside to greet potential visitors who specifically liked that store and attract them by sending out personalized offers. And once they are inside, the in-store beacons will help give product reviews and information when customers approach a particular rack or display. Moreover, beacons at cash counter can wake up the smartphone and allow loyalty points and coupons to pop out, preventing the customers from fumbling through their messages while other customers have to wait in the queue behind. Location based tracking technology is evolving every day with the use of beacon and geofencing used together, offering countless opportunities. Even in the enterprise mobility space, there are several advantages of using EMM with Beacon. Moreover, with the continuous development of iOS and Android platforms, users can get advanced EMM support in real time. Therefore, it is up to businesses to select the method which best fits their needs and the way they intend to engage with their customers.